In the cruel city of New Delhi, people in the seat of power have some fascinating insights into politics which the media, normally, is incapable of visualising. 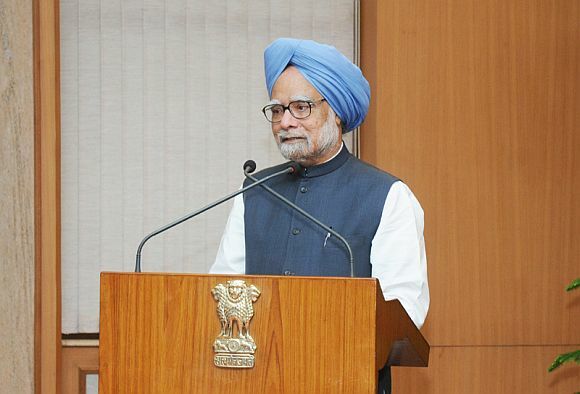 There is little to cheer on Prime Minister Manmohan Singh's 80th birthday, but birthdays are a happy event so an excuse should be found even if none exists. After all, birthdays are a god-given chance to rejoice. Rediff.com encountered a babu, a white-collared government officer, on the eve of the PM's birthday. A high-ranking officer with an extraordinary knack for how New Delhi works, gave a five-point programme and one funda to save the PM's reputation and uplift the Congress party's sinking fortunes, in an exclusive but off-the-record conversation. 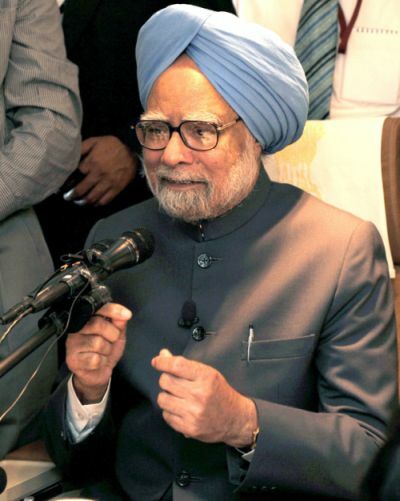 Funda Number One: At the ripe age of 80, Prime Minister Manmohan Singh should not change his image. He is pro-liberalisation, against high-spending on populist schemes, and prefers the Western model of development. Let him remain what is known to all of us. He should not change his public image. Action Number One: In the next 20 days he should take reforms to the next level. He should introduce major reforms in insurance, in the pension sector, he should change the fundamental way in which the railways and health sector function. He should not wait. Delay is suicidal when the Congress Working Committee has given you the thumbs up! Action Number Two: Bring in the Food Security Bill disregarding any opposition (there will be none, as no sane political party can dare to oppose it) and have it passed in Parliament. Action Number Three: He should demonstrate a spirit of emergency as the CWC has unabashedly given him total support. Just grab the opportunity! He should also ensure, with the help of Sonia Gandhi, that the likes of P Chidambaram, who are frighteningly ambitious about seizing his seat, don't play speed-breaker covertly. There is an unhappy class in the Congress that is seeing him succeed in gaining momentum. Never forget, in New Delhi success has no friends. Action Number Four: Call Nandan Nilekani. Already, as of September 15, 2012, some 19 crore plus Aadhar cards have been issued. Get from Nilekani the list of below-the-poverty line Indians who have got an Aadhar card. It won't take time since everything is computerised. Implement all the central schemes via digital banking and via a single window at the district level revenue office. Cash transfer for social schemes should start with immediate effect. The cash in their bank accounts from the central government, meaning from Sonia Gandhi (as Congressmen are cunning enough to popularise), will delight poor people like never before. Action Number Five: One scheme that India should be proud of is issuing Kisan cards. This pan-Indian scheme is more or less a success, with around 10 crore farmers having one. It gives them easy loan/cash from nationalised banks for farming activity. Let the central government issue a directive to distribute subsidised diesel and subsidised fertilisers through the Kisan card to non- resourceful farmers like Dalits, tribals and landless tillers. This government officer, who works in New Delhi, says all these actions are possible to administer and are implementable within three months. When the poor people are "touched" through their bank accounts and when deserving farmers get cheap diesel and cheap fertilisers through their Kisan card, the Congress party will be able to cover its traditional vote banks. These quick-fix ideas will call the Bharatiya Janata Party's bluff as well, and there is no way it can oppose such a direct disbursement of government funds. Once the historic reforms are done and balanced through real-time benefits to poor Indians through Aadhar and Kisan cards, Dr Singh should address the nation -- and resign!